Before we start this week, I just want to thank all of you for coming along on this adventure with me! It’s been an incredible (and incredibly eventful) season across the board and I’ve had an absolute blast getting to talk about it here every week. I hope you’re as excited as I am to see where Season 3 goes because...man, for all the solutions the team may have come up with this time around, they definitely have no shortage of new problems to tackle. But we’ll get to that in a second. First, let’s take a look at what just happened here, because time travel certainly isn’t getting any less mind melting now is it? Just in case you need a quick refresher, we left our team in a bit of a rough spot. The Legion had recreated reality in their own image, Amaya had been killed and the Spear had been destroyed leaving the team with no real way to undo the changes the Legion had made. ...Well, that is, unless they’re willing to violate one of the biggest and most important rules in time travel: interfering with events they’ve already interfered in. That’s right, it’s back to World War I with the team for a second pass at preventing the Spear from falling into the Legion’s hands in the first place, which is where things get...tricky. In revisiting their own past, the team has to be careful to not interact with themselves or they risk creating a time paradox. Oh, right, and they have to get Rip and the Waverider back before they can time travel at all, which is both easier and harder than expected. Namely because Rip and the ship are actually right under the team’s nose in S.T.A.R. Labs, but also because Rip and the ship are literally right under the team’s nose in S.T.A.R. Labs. Thawne used Ray’s Atom tech to shrink the Waverider down to the side of a toy model with Rip inside. So, that’s a problem. Luckily, retrieving Ray’s Atom suit kills two birds with one stone, giving Ray his abilities back and restoring both Rip and the Waverider to their actual size. Unfortunately, Rip’s cakes and decorating supplies don’t fair all that well in the transition. But with the ability to time travel restored, avoiding their past selves becomes a huge challenge for everyone who isn’t Amaya (who died in the future,) Ray (who dies in the past) and Stein (who’s still brainwashed in the future). Remember how I said this was complicated? So, naturally, the two separate Legends teams end up colliding to take on the Legion together, which is great until it inspires Thawne to take a page out of their book and gather his own time paradox clones to form a Reverse-Flash army. You know, just in case the fabric of time, space and reality wasn’t already undergoing enough stress as it was. Luckily, Sara is able to take the Spear (the Spear from the past, that is, before it was destroyed in the Doomworld future) and use it to erase itself from existence, creating yet another paradox, but effectively undoing everything the Legion did with it when it was in their power. After all, the Legion can’t own the Spear in 2017 if it never existed in the first place, right? The colliding realities force the future time doppelganger Legends to fade out of existence (no Doomworld, no future versions of themselves) and effectively creates a timeline where Ray, Amaya and Stein are all back to normal. Unfortunately, like Rip continued to warn everyone, it also...kinda breaks time. Even after the Legends place the Legion (minus Thawne who was finally, finally taken out by the Black Flash—I can’t believe I was almost rooting for that guy back in Moonshot!) back into their own timelines and erases their memories of the future, it’s still not enough to repair the wildly upset balance of the universe. When the team gets back to 2017, they find Los Angeles has pretty much turned into Jurassic Park. As someone who lives in Los Angeles during 2017, I’m pretty confident when I say it’s most certainly not Jurassic Park out here. Of course, we also have to talk about Rip’s departure from the crew. For as bittersweet as it was, I have to say I did agree with him. He needs to go make his own way for a while, do a little soul searching, find out who he is if he’s not captain of the Waverider. I do hope he can come back in the future, but in the meantime, I think it’s safe to say that the Waverider has room for at least one new crewmember. Any ideas who would make a good candidate to fill the gap? Then again, with time totally broken and the Spear of Destiny totally destroyed, I would venture a guess that figuring out how to undo the damage they’ve done without undoing the good is probably going to be priority number one...so maybe a recruitment drive will be bumped down the list a bit. But look on the bright side guys; Aruba will still be there for a nice vacation getaway once everything settles down. Probably. Meg Downey covers DC's Legends of Tomorrow as a part of the #DCTV Couch Club. Look for Meg on Twitter at @rustypolished. 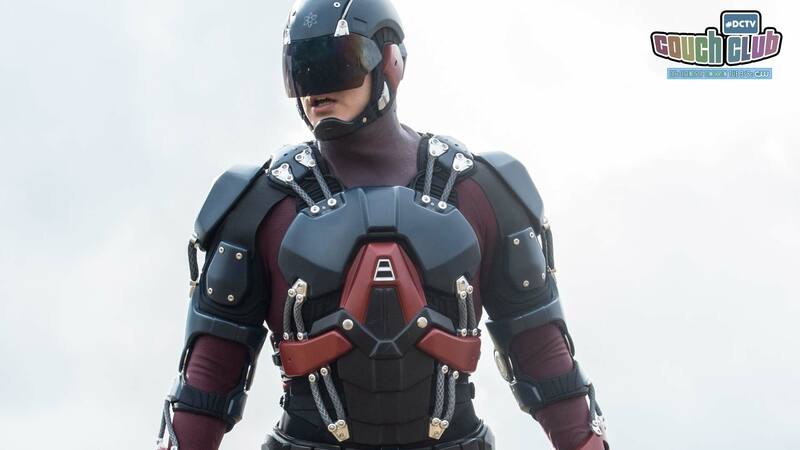 DC's Legends of Tomorrow airs Tuesdays at 9 p.m. (8 p.m. CST) on The CW. Preview Monday: Everafter: From the Pages of Fables #8!